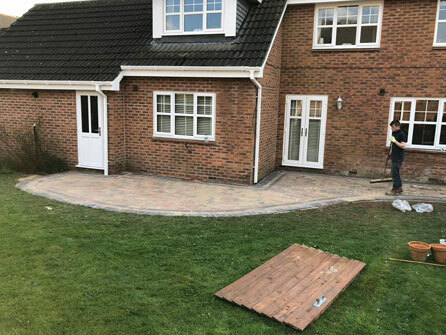 Our experienced team at Brooklands Paving Systems Ltd design and install stunning patios for you and your family to enjoy, either using your ideas or you can leave it to us to come up with a bespoke look for your garden. 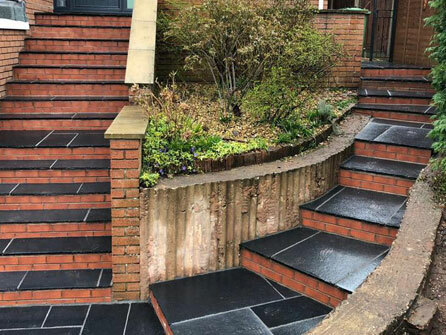 Made from either natural stone, indian sandstone or old fashioned slabs, the same attention to detail will be applied by our team whichever building material you choose. 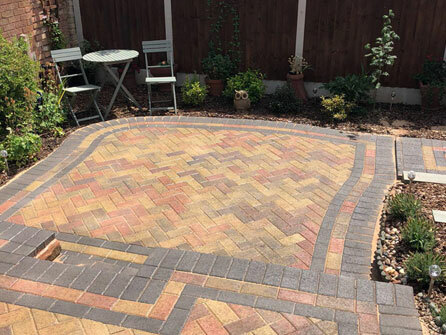 With over 25 years’ experience in the paving and driveway industry, our team have completed many patios of varying sizes. Our team will first of all organise a home visit to look at the space we have to work with. 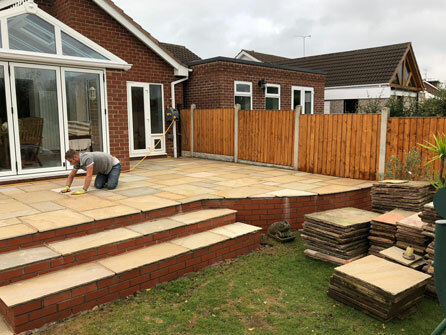 We will make recommendations as to what we think would look good in your garden and ask questions to ascertain the way you and your family use the space. Our team will help you decide on the materials, colours, shape of the patio and also if there will be any other components such as balustrades, steps or lighting. 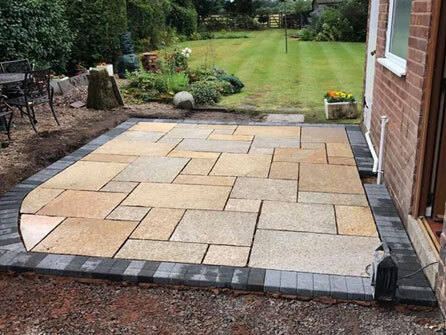 A well designed patio can extend your living space and that is why it needs careful planning to make sure the space works for you now but will also work well for you in the future when your family either decreases in size or increases. It doesn´t matter whether you have a modern, traditional or a listed home, our team will be able to advise you accordingly on what materials will look best for your property. 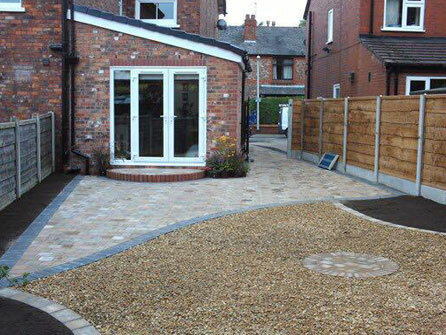 Existing pathways can be blended in to your new patio or we can build new pathways for you, no job is too big or too small for our team to handle. 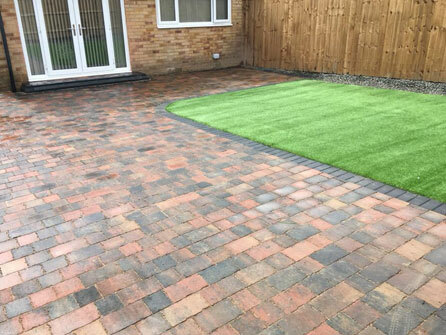 We can compliment your patio with our hard landscaping such as fencing, walling, turfing or artificial grass installation, see our Landscaping page for more information. 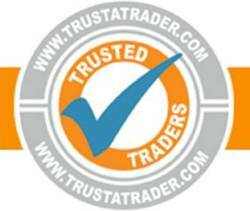 Free no obligation quotations at affordable prices and a 14 day cooling off period. 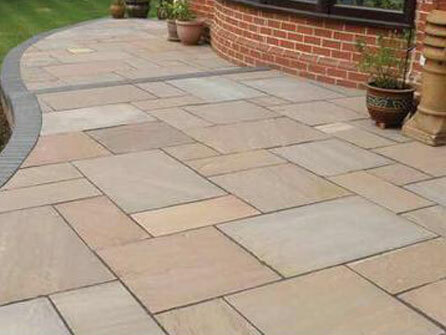 Call our friendly team today for your patio needs on any of the numbers at the top of the page, we look forward to helping you with your enquiry.